Known in Michigan only from lawns, roadsides, and sandy banks; introduced from farther south, though apparently native as far north as Pelee Island in Lake Erie, Ontario. 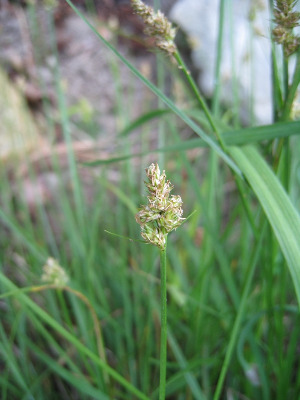 First collected in 1937 in Kalamazoo Co.
Carex leavenworthii is reminiscent of a slender, narrow-leaved C. cephalophora. It has shorter-awned pistillate scales and the perigynium beaks are shorter. The perigynia turn from pale green eventually to pale brown. Carex cephalophora has at least the lower pistillate scales clearly awned, longer perigynium breaks, and the perigynia that turn a yellow-green to golden yellow color at full maturity. MICHIGAN FLORA ONLINE. A. A. Reznicek, E. G. Voss, & B. S. Walters. February 2011. University of Michigan. Web. 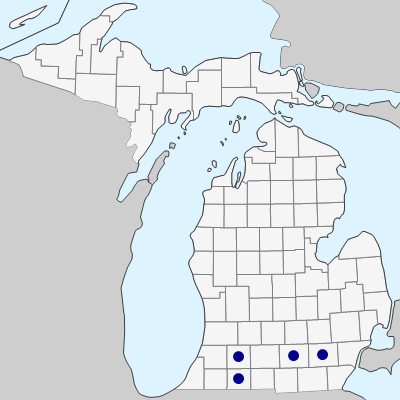 April 21, 2019. https://michiganflora.net/species.aspx?id=993.